Home Gardening Flowers to Add Color! 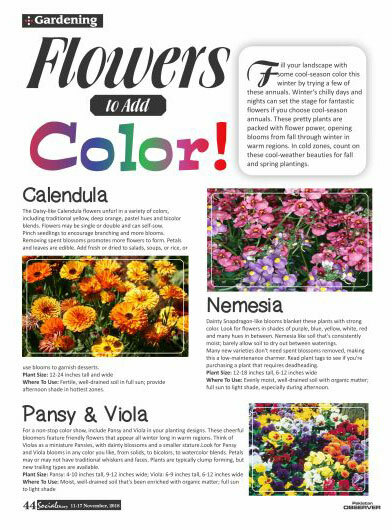 Fill your landscape with some cool-season color this winter by trying a few of these annuals. Winter’s chilly days and nights can set the stage for fantastic flowers if you choose cool-season annuals. These pretty plants are packed with flower power, opening blooms from fall through winter in warm regions. In cold zones, count on these cool-weather beauties for fall and spring plantings. 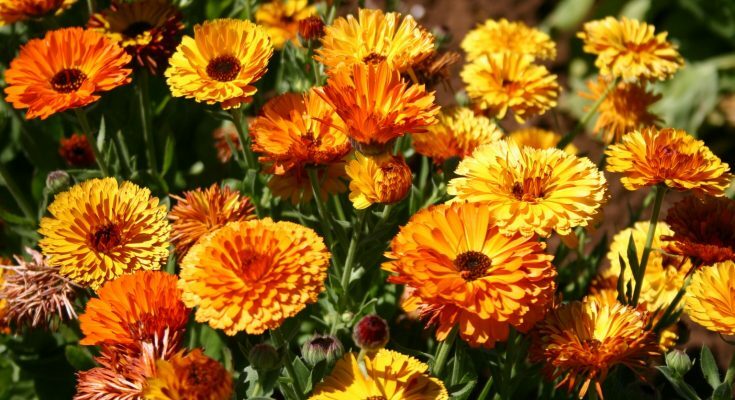 The Daisy-like Calendula flowers unfurl in a variety of colors, including traditional yellow, deep orange, pastel hues and bicolor blends. Flowers may be single or double and can self-sow. Pinch seedlings to encourage branching and more blooms. Removing spent blossoms promotes more flowers to form. Petals and leaves are edible. Add fresh or dried to salads, soups, or rice, or use blooms to garnish desserts. Dainty Snapdragon-like blooms blanket these plants with strong color. Look for flowers in shades of purple, blue, yellow, white, red and many hues in between. Nemesia like soil that’s consistently moist; barely allow soil to dry out between waterings. Many new varieties don’t need spent blossoms removed, making this a low-maintenance charmer. Read plant tags to see if you’re purchasing a plant that requires deadheading. For a non-stop color show, include Pansy and Viola in your planting designs. These cheerful bloomers feature friendly flowers that appear all winter long in warm regions. Think of Violas as a miniature Pansies, with dainty blossoms and a smaller stature. Look for Pansy and Viola blooms in any color you like, from solids, to bicolors, to watercolor blends. Petals may or may not have traditional whiskers and faces. Plants are typically clump forming, but new trailing types are available. Previous Post3 Chocolate Chip Cookies Next PostFollow Shahzad Noor to Italy!